Offers your rest pleasantly in 46 distinguished rooms of 41 square meters bedroom. Pleasuring the greenery fresh beauty of our big sparkling flower garden, absorbing beautiful smell and air pleasantly during your stay. 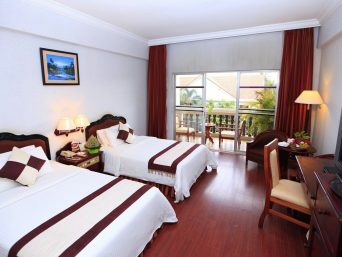 A spacious luxurious room will rest you pleasantly in a 2 suites of 58 square meters bedroom with big bathroom. With it high concept of exclusive decoration, you will feel unforgettable moment during your stay and tour with us.